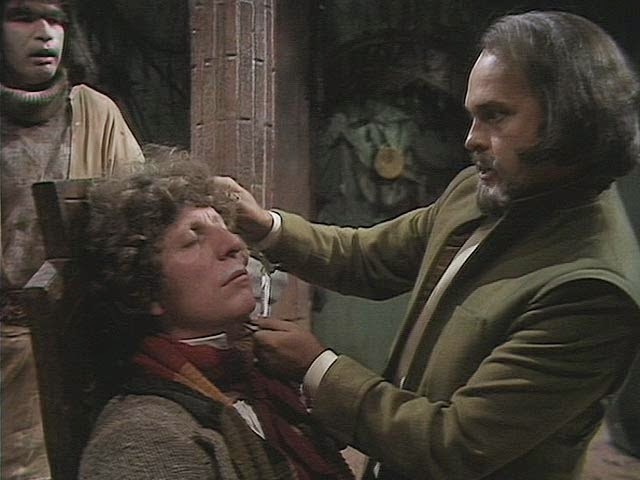 Doctor Who: Looking back at THE BRAIN OF MORBIUS | Warped Factor - Words in the Key of Geek. DOCTOR: Come out, meddlesome, interfering idiots. I know you're up there so come on out and show yourselves! Messing about with my TARDIS. Dragging us a thousand parsecs off course. SARAH: Oi, have you gone potty? Who are you shouting at? DOCTOR: The Time Lords, who else? Now, you see? You see? They haven't even got the common decency to come out and show their ears. SARAH: They're probably afraid of getting them boxed, the way you're carrying on. DOCTOR: It's intolerable. I won't stand for any more of it. SARAH: Oh look, why can't it have just gone wrong again? DOCTOR: What? Do you think I don't know the difference between an internal fault and an external influence? Oh, no, no, no. There's something going on here, some dirty work they won't touch with their lily white hands. Well, I won't do it, do you hear? He's not even particularly bothered by where they find themselves, either. As he tells us ''I don't know and I don't really care''. Of course, he doesn't really deliver on his threat to '' sit here and do nothing.'' Quite right too! After all there's more to life than playing with a yo-yo, even after spending a chunk of your previous incarnation as a galactic one. By which logic we know he won't simply '' sit here and practise my double loops ''. MAREN: Is it as I feared? For months now I have had a dream that the Elixir of Life would be taken from us. MAREN: Next to myself, Ohica, you are the oldest of our sisterhood. Come, let me show you. OHICA: The Flame of Life! Maren, what is wrong? Why is it so low? MAREN: The Flame dies, Ohica. Every month, every day, it sinks lower. OHICA: How can this be? At our ceremonies the Flame has burned brightly, higher than my shoulder. MAREN: A deception. For many months past, before each ceremony, I have secretly fed the Flame with powdered Rine Weed. OHICA: But if the Flame dies, there will be no more Elixir. MAREN: It has been low now for over a year. The vessel remains empty. OHICA: Then we are doomed. Our sisterhood will perish. MAREN: We are only servants of the Flame. If the Flame dies, then so must we. Meanwhile, the Doctor & Sarah are now house-guests of a certain mad scientist, who's overwhelmed by the quality of '' a magnificent head''. While everybody's enjoying a little wine, as you do, Solon's very happy indeed. Not only is he quaffing a glass with an almost chilling urbane sophistication, but clearly coldly delighted. '' You know, I always knew that one day I'd have a guest with a head for such a fine vintage.''. He's got more pressing matters to attend to than ordering Condo to bring out some accompanying cheese & biscuits! 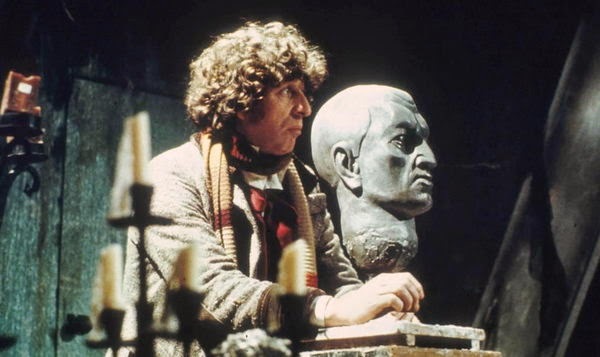 Even when he's a little tipsy the Doctor is clearly still brilliant at doing a little detective work, & he's finally cracked who the subject of that bust his host initially so proudly displays is- '' I know who that reminds me of now. One of the Time Lords. Morbius.''. How does it all turn out? 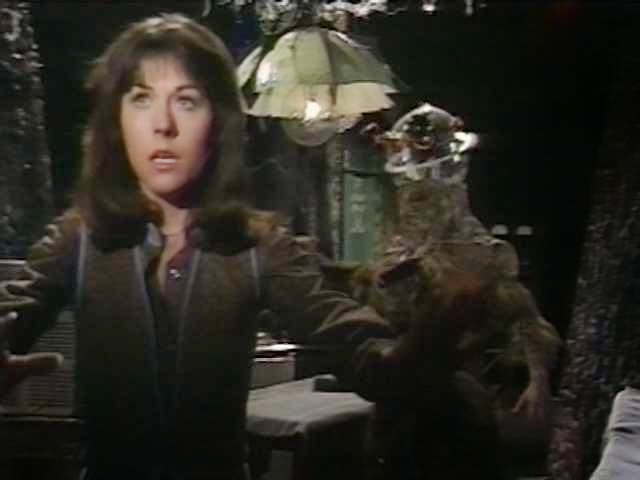 Well, there is no better day to either discover The Brain of Morbius for yourself, or to re-watch this beloved Fourth Doctor classic, than the anniversary of its broadcast. So pop in that DVD and turn down the lights. But we warn you, it is creepy!